According to the 1962 Missal of St. John XXIII the Extraordinary Form of the Roman Rite, today is the feast of St. Francis Borgia, a descendant of the notorious Alexander VI. He spent a part of his life in collecting titles and offices of importance. Certain reverses of fortune caused him to reflect on his life. 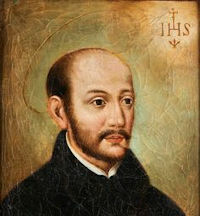 He was already a Franciscan tertiary, but this was not enough for him; he became a Jesuit, at first secretly and then publicly in 1550 having made provision for his eight children. In 1565 he became General of the Society of Jesus. He was a man of wide experience, a clever diplomat and ranks as the second founder of his Order. He died in Rome on October 1, 1572. Francis Borgia, viscount of Catalonia and third general of the Jesuits, was born in 1510. On his father's side he was a great-grandchild of Pope Alexander VI; on his mother's side he was the great-grandchild of a son of Ferdinand the Catholic. His holy life atoned for the sins of his ancestors. As viscount and duke at the palace of Emperor Charles V, Francis stood in high honor. The sudden death of the beautiful Empress Isabella (May 1, 1539) and the sight of her disfigured face as her body was taken to Granada made him resolve to leave the world and serve the King of kings alone. After the death of his wife (1546), he entered the Society of Jesus with the holy resolve of leading a hidden life and of closing the door forever to all earthly honors. His example of humility exercised an influence upon Charles V when he considered renouncing the throne. Devoted to labor and severe mortification, Francis held himself in such little esteem that he called himself the "poor sinner." In 1565 he became General of the Order. He died at Rome. Patron: Against earthquakes; Portugal; Rota; Marianas. Symbols: Skull crowned with an emperor's diadem. Although Francis lived a holy life, he was deeply moved and changed his life even more profoundly after seeing the corpse of the young and once beautiful Empress Isabella — it was totally disfigured and unrecognizable. This made him realize the transcience of life and the worthlessness of riches. We should follow his example and meditate on this. Learn more about the infamous Borgia family tree. Cook or bake some Spanish dishes, such as tapas, paella, gazpacho. Read more about St. Francis Borgia.